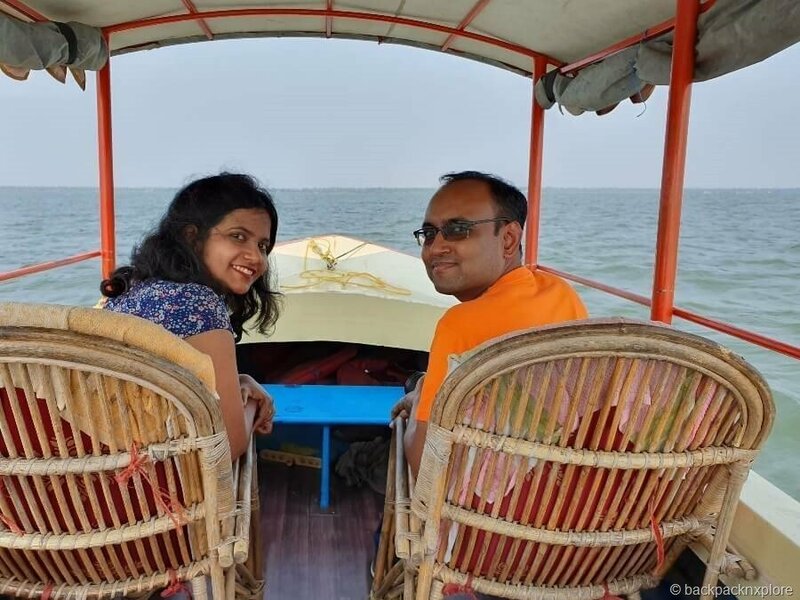 The wind tore through the scorching heat soothing our tired bodies like a therapeutic balm as we sat on our shikara gliding through the famous backwaters of Kerala. 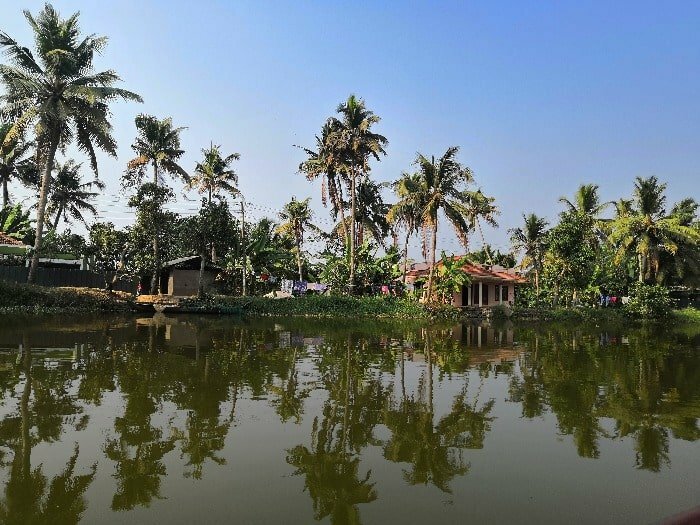 As the beautiful scenes of the idyllic Vembanad lake unfolded in front of our sleepy eyes, somewhere the dreams and reality blended like in a drunken stupor. A whimsical booking made way for the most ambitious weekend road trip we have had so far. Bangalore to Alleppey / Kumarakom– that’s almost 600 km! That’s ok, we did drive longer distances before. But here’s the catch. It was just another weekend, and we would have to drive the same distance, or a little more the very next day on our way back. Not to forget the deadly Monday that would follow leaving us absolutely no time to settle down for real life. The Lemon Tree Vembanad Lake Resort – This is where to stay in Alleppey! It all started with our car-pool friends discussing their travel plans on Holi weekend, on a Thursday. Both of them had pre-booked air-tickets to Kochi and hotels booked at Alleppey. Chayan was quick to jump into the conclusion that we are missing out on all the fun, completely disregarding the fact that we were back from a trip to Thekkady less than a fortnight ago. We came back and started checking hotel options when we stumbled upon the Lemon Tree Vembanad Lake Resort. This 4-star luxury was available on MakeMyTrip at just Rs.3500! Including taxes and breakfast, the total invoice came up to Rs. 4500. 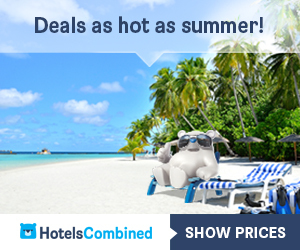 That’s quite a steal when you see the pictures and compare prices of this luxury hotel online. 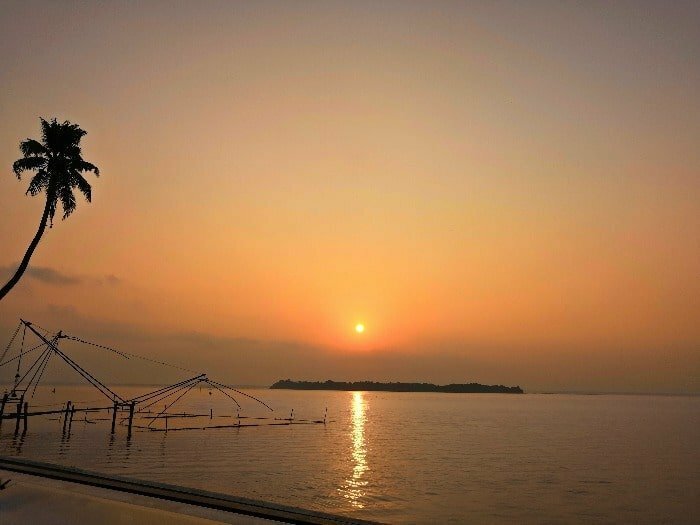 Read our complete review of Lemon Tree Vembanad Lake Resort here. A road trip to Alleppey is not the most practical idea on a normal weekend. I really wanted to book an overnight Volvo bus that leaves Bangalore on Friday and reaches Alleppey on Saturday morning. But for Chayan, the romance of a road trip trumps the practicalities, a secret he tried to hide by saying how cheaper a self-drive is compared to the cost of hiring a cab for sightseeing. Well, the perfect roads almost throughout our long journey didn’t leave me with a chance to argue. We started at 3 am sharp, after a 3-hour nap at night. By the time of sunrise, we had already covered 250 km, and that’s when we met with the first surprise – a bunch of peacocks walking along the road. Of course, the scene called for an unplanned break. I also managed to capture the last few moments of sunrise. I have nothing but good words to say about South India’s roads in general especially when it comes to the well-connected highways. The entire driving route from Bangalore to Alleppey is currently as close to perfect as you can imagine in India. It was only in Kochi that we were slowed down by the traffic congestion, unexpected for a weekend. Despite a short detour caused by Google God’s whims we managed to reach our resort at 12:30 pm. Rent a car on Myles or ZoomCar to self-drive on your next road trip! The hotel is located right at the bank of the Vembanad lake opposite to the Kumarakom bird sanctuary. We could not have asked for a better location, especially after drivig through a sleepless night. The large spacious lake-view room was equipped with all modern amenities but still had an earthy feel to it. The windows opened to a view that can be described in just one word – “picturesque”. I have read that the cheapest way to explore the backwaters of Kerala is by the local ferry. I would certainly try that out on my next trip. In no way were we going to get on our car right after lunch to search for the ferry station. We had less than 24 hours in Alleppey, so time was precious, and so was our energy. The staff who escorted us to our room gave us a list of places to explore nearby and told us about the private boat trips on “shikara”. The boat trip would cost Rs. 1200 per hour, a bit higher for the off-season, but in no way unreasonable because of the 4-star brand. We booked a 3-hour boat-ride from 3 pm and went for lunch. 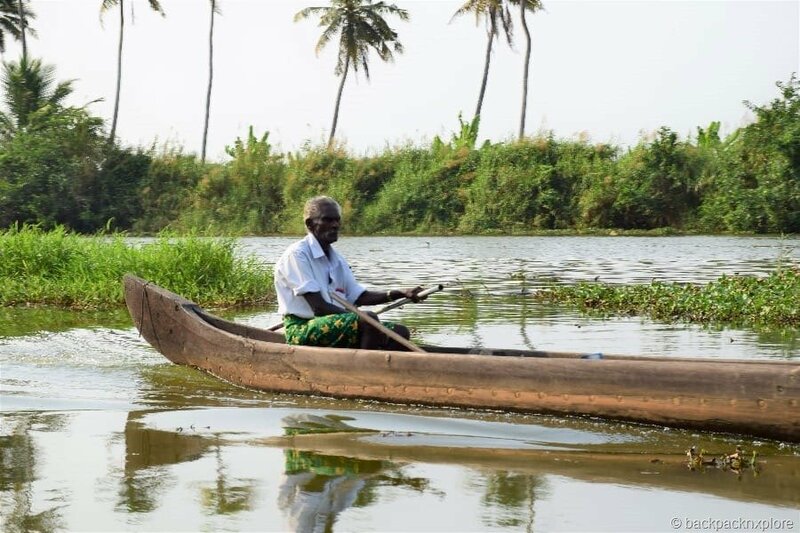 There are many ways to explore the world-renowned waterways of Kerala. Houseboats for the seekers of luxury, canoes for the adventurists, tourist ferries for the budget-friendly, public ferries for the ones who want to travel like a local. Shikara falls somewhere in the middle of the spectrum. These are small motorized boats with a covered roof with seats for four. These traditional cane chairs have a long back-support and are designed for you to recline and have tea at your verandah. Our cheerful captain greeted us and guided us through the trip. He told us the place right here was covered in colorful blossoms even two weeks back, but they have now dried up due to the scorching heat. He wasn’t exaggerating at all, we could see the dead flowers all our way. For those unaware of the touch-and-go Spring of coastal India, there’s a saying that there are only three seasons in the coast here– summer, “summerer”, and “summerest”. March is summer..er. Soon we forgot all about the heat as the roof blocked the direct sun and the embalming breeze started to blow. A whole new world unfolded before us with birds, floating grasslands, colorful boats of all shapes and sizes sailing at the speed of a snail on the never-ending expanse of the pristine lake. This was a different world, a world where men lived in harmony with nature, just like the birds. We were now in the middle of the lake sailing near the Patharimanal island. Hoards of migratory birds were there to greet us and pose for us as we took pictures. Well, there were just fishing for leisure or basking in the sun. I saw this super-flexible model looking directly at the sun and wanted to say “are you mad? you’ll either twist your next or go blind”. She didn’t listen, so I just took the picture she posed for and went back to our comfortable recline. As soon as I did so, I found myself speaking to the birds, then I heard my mom called for tea. But she’s over 2000 km away in Kolkata I thought, and I woke up. It was time to make a video call to our parents in an endeavor to remote-share the experience with them. 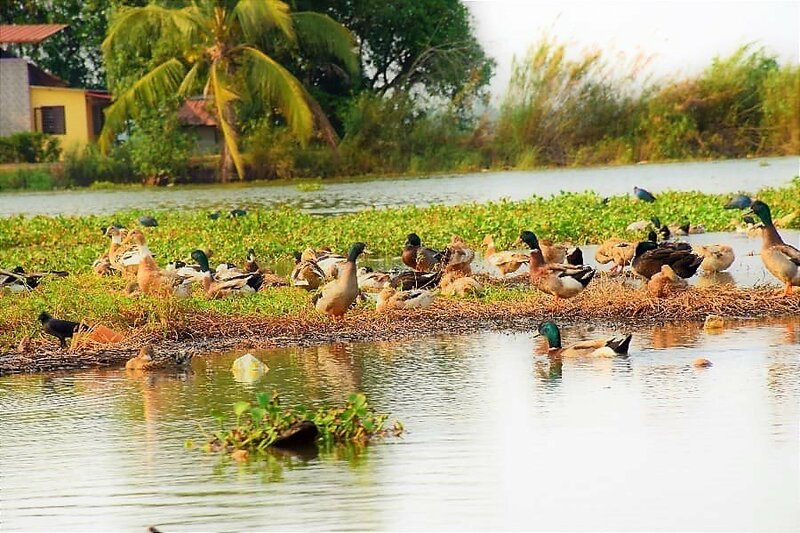 Now we were leaving the main lake and approaching towards the narrow canals of Kumarakom – the safe haven of birds from all over the world. November to February is the best time to see a multitude of migratory birds from different parts of the world flock into the island for Summer. As I said it was “summerer” already, but many of them were still there. I have already had a couple of interesting 2-minute hallucinations by now. 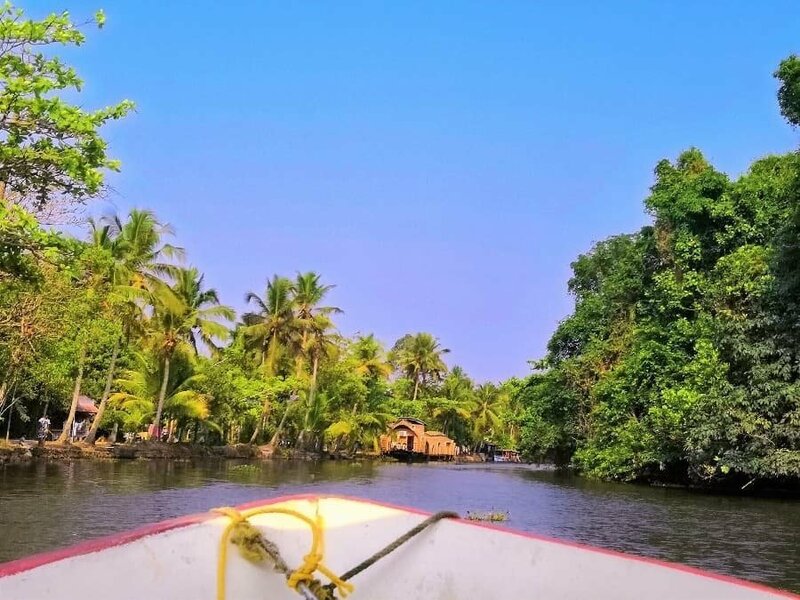 There’s something about the backwaters of Kerala that blurs the difference between dreams and reality, that takes you back to your roots and gives you the wings to fly. Either that or the wind was just laced with opium resulting in the dreamy experience. We suddenly saw scores of ducks and moorhens in different colors and patterns gliding on the brackish lakes with the discipline of scout boys. And then we saw more, and even more of them. There was not a chance to blink my eyes and miss a single moment of these. 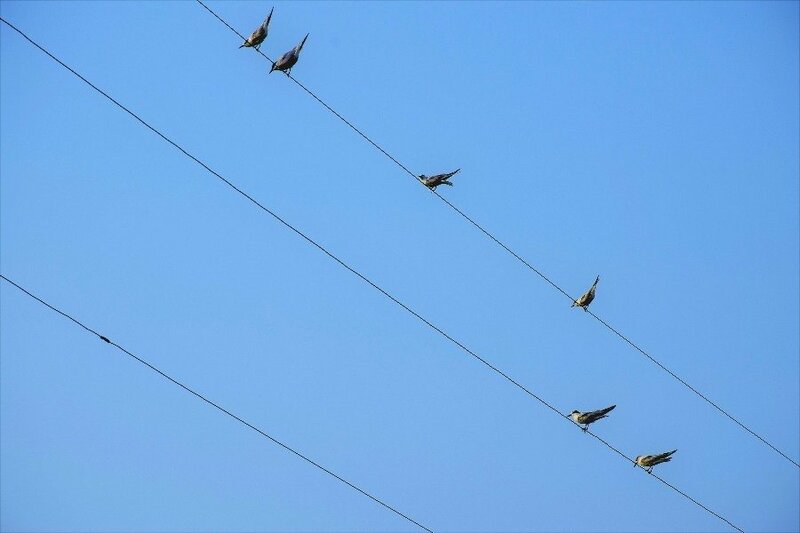 I looked up and saw a few tiny birds perched on the cable. 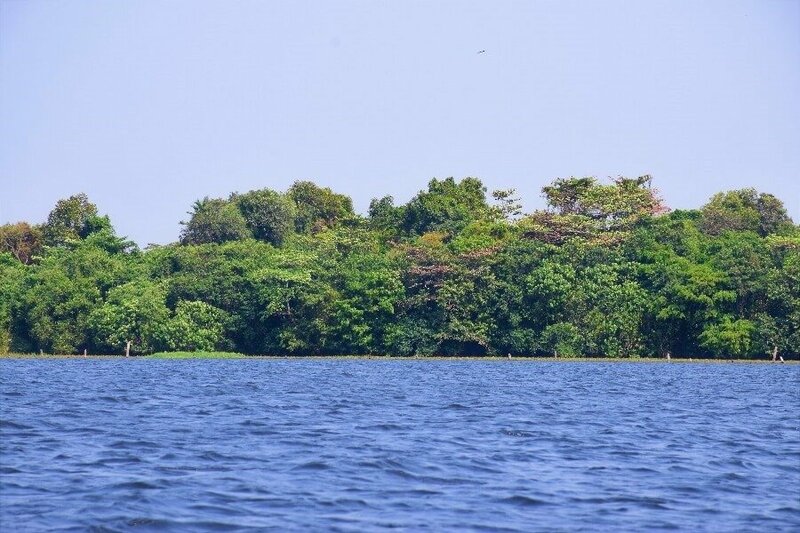 Waterfowls, egrets, cormorant, darter, and flycatchers abound the ecosystem of these 14 acres of sprawling forests on the water. Now we entered into the narrow canals cutting through coconut groves. I looked beyond the coconut groves and found the green paddy fields. The waterways now got narrower as we entered into the villages of Kottayam. Colorful houses with clothes hung outside to dry, children playing and waving at us, boats with fishing nets tied to the banks – that’s the typical life of the villagers who get to call this heaven home. We got down at the shop to walk around a bit and explore the local handicrafts. 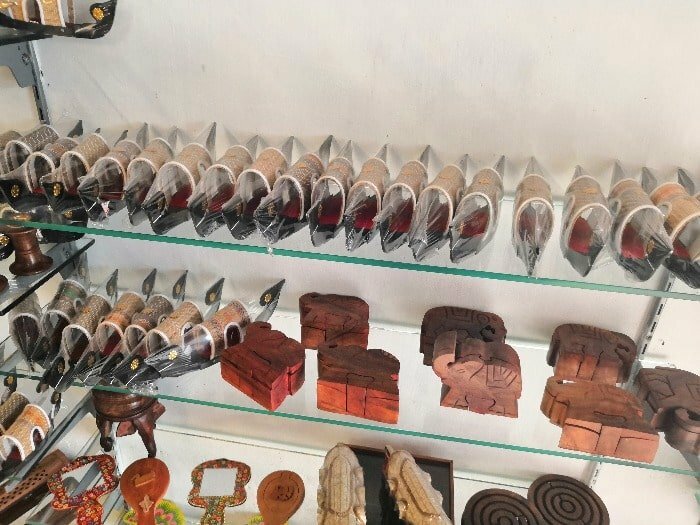 Miniature boats, ornamented elephants, peacocks, beautifully handcrafted wallets, bags .. the list of things to buy in Kerala is unending. I bought a few souvenirs to take home. We checked out some fresh fish which were ready to be fried and served on request. We didn’t have the appetite for that after the wholesome lunch we already had, so we drank the fresh coconut water instead. And finally at the last lap of our tour, on our way back to the resort we were fortunate to witness the sunset. It was on the same side as that of our resort. We couldn’t have seen these reflections had we not been in the lake at the golden hour. After this soulful experience, we took a stroll around the resort, the infinity pool, and the green courtyard before we retired to the jacuzzi for washing away all the exhaustion. We had an early dinner and slept at 9! I don’t remember the last time I went to bed at 9. I also don’t remember the last time I woke up not to the sound of a calling bell or alarm but to the sound of pigeons. Our short trip was full of highlights, but if there was a zenith it was nothing but this. I checked that the sunrise was expected to happen at 6:30 am., but I woke up much before the alarm rang. The darkness was gone as the Sun was on His way to the earth while the Moon waited patiently between the canopies. For the fishermen who were already in the middle of the lake adjusting their fishing nets, this must be an everyday scene. But for someone whose life revolves in daily commute across the concrete jungle, this was magical. It was magical to see the sky change its colors and shades of peaches and oranges engulf the lake. I’m not a writer, and so I made this video to capture the beauty that I couldn’t express in words. It was now time to get ready to leave. We had a long distance to cover and I was happy with all that we saw already. But the beach was calling. Who comes to a beach town and leave without seeing the ocean? We started at 9:15 in the morning after breakfast and headed to the Alleppey lighthouse. A climb up through the narrow flight of stairs took us to the top of the lighthouse from where we saw the city from a bird’s eye, almost. Our next stop was the Alleppey beach followed by the Marari beach. Both of them were beautiful, clean, gorgeous and of course, smoking hot..literally. Apart from the serene wonders of nature, Alleppey surprised us with its wealth of religious architecture. The city was speckled with numerous beautiful churches and temples. We passed by them with the promise to return again, next time with a little more time. 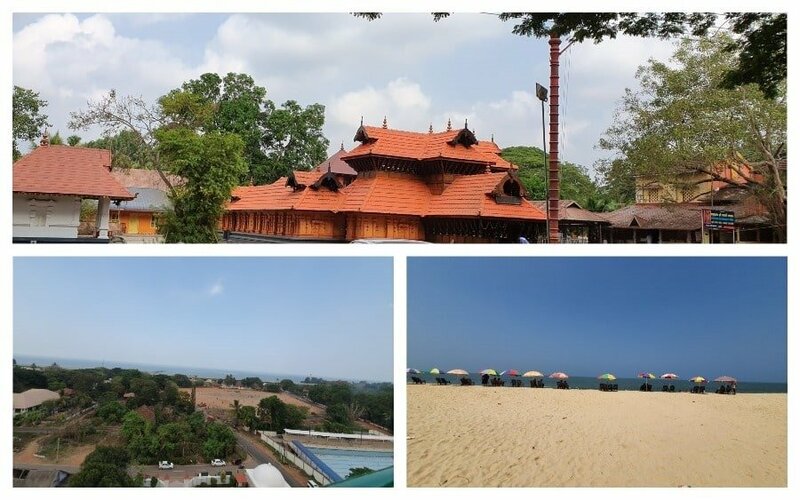 We had to stop at the amazingly beautiful Mulakkal Temple, 15 km away from our resort to see the 500-year-old temple. 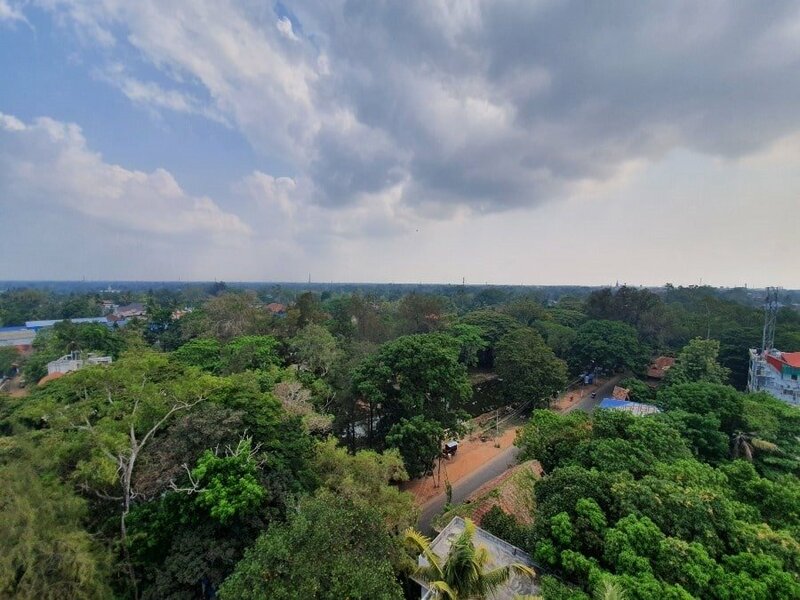 The trip we took is not a pragmatic choice, especially if you are not comfortable driving long distances, or are not sure that you would return to Alleppey again. Two days is a good enough time to explore Alleppey and Kumarakom although, the more the better. So I’d recommend planning this trip for a long weekend. However, if you don’t have that extra day, just take an early morning flight to Kochi. Then hire a cab from Kochi to Alleppey. If the prices are too high, you can simply book the overnight Volvo buses on Friday, sleep comfortably and wake up at Alleppey next day. Not only will you save energy you would also be able to spend a little more time. However, if you do decide to choose this road trip like us, here are some tips. Make sure that you are in the city when its dark. Do not try driving in the hills at night no matter how good the roads are. Start early on your way back to account for the infamous Bangalore traffic. Take a nice shower before you leave your home for a long drive at night. It will keep you rejuvenated for the rest of the trip. 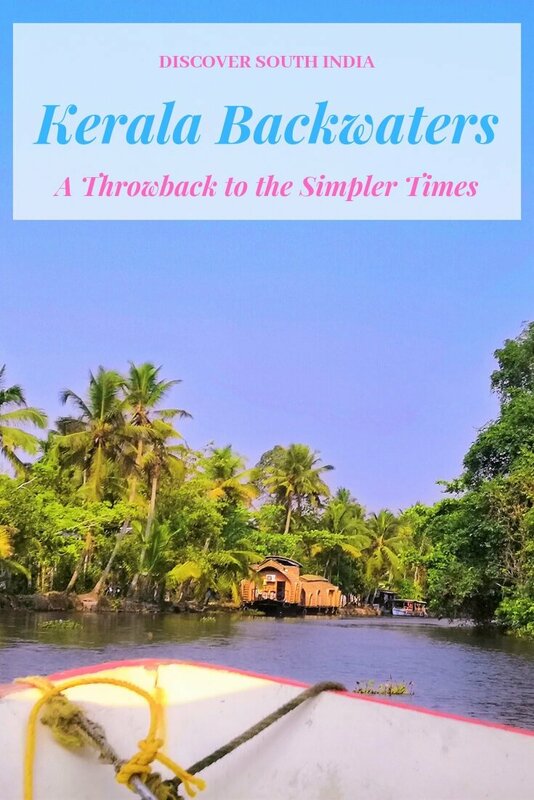 Hope you liked this experiential travelogue of our whimsical wanderlust at the backwaters of Kerala. Strangely in this unplanned trip where we probably spent the shortest time in the destination, we got a taste of slow travel. We watched the sunset, we watched the sunrise, we dreamt in the boat and discovered hidden gems on the road like the random peacock sanctuary. 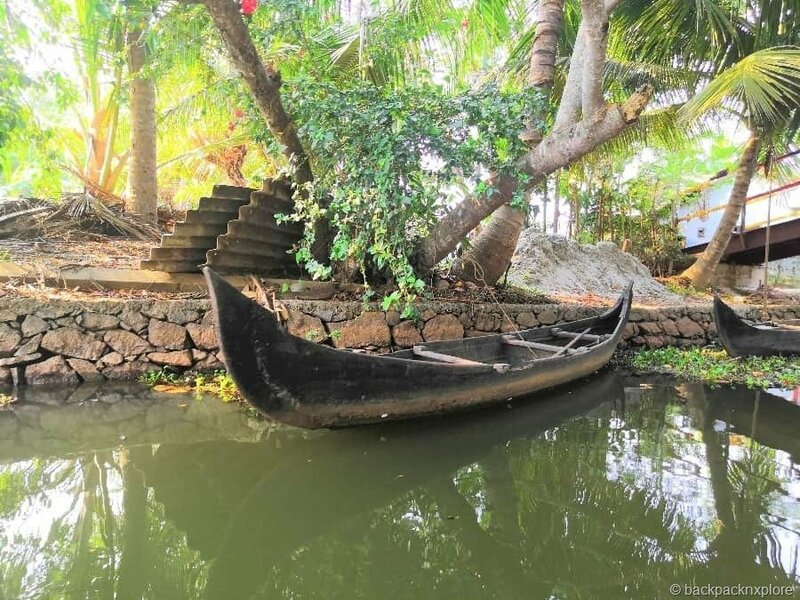 It’s easy to explore Alleppey as everywhere you look there another waterway, another pretty boat, another lovely church or the beautiful beach. So if you have been procrastinating on your plans to visit the backwaters of Kerala wondering if it is worth it, I hope you don’t anymore. Share this story with your friends if you liked it. Subscribe to never miss a new post on Backpack & Explore. Save this pin to read later again. Disclosure: The post contains affiliate links for accomodation. This means if you book through those links, I will get a small commission for referal, without any additional cost to you. wow that is an ambitious weekend trip! 600 km is quite far but it looks like it was worth it. I enjoyed seeing the lovely pictures of wildlife and I would also wake up for that beautiful sunrise! A long road trip but well worth it. 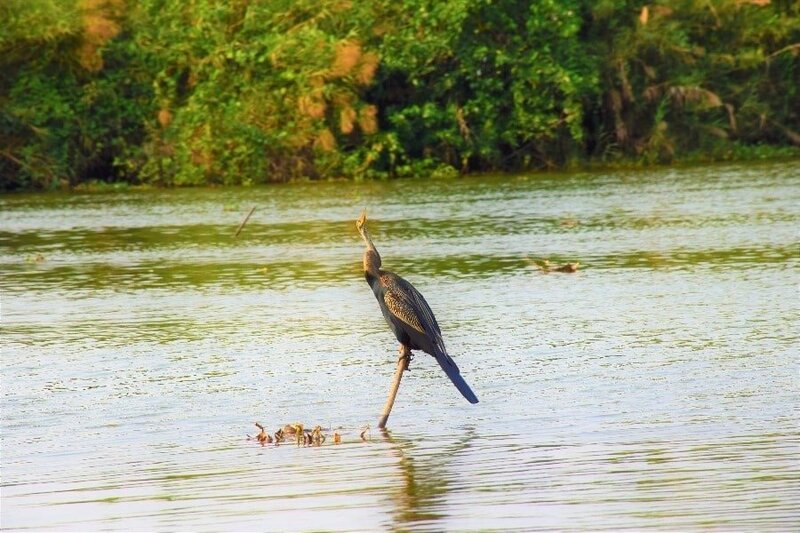 The bird life is incredible along the backwaters. We spent a night on a houseboat and loved every minute of it. Although it was a little busy leaving the docks it soon turned into a very peaceful afternoon sailing the canal areas. Such a beautiful part of India. 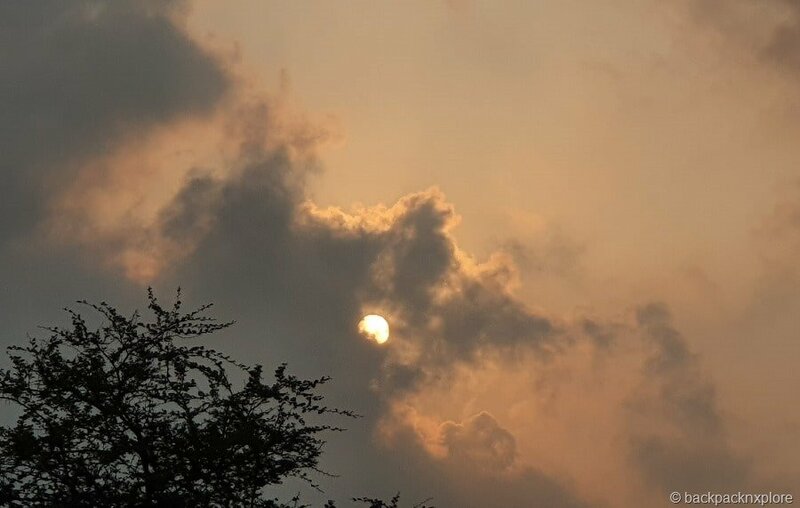 Your video embedded in the article says alot about your love for sun rise and sun set. I am glad you had fun in such short duration. Thanks Sreekar. Yes, you should try it but an extra day would always help. The place is so beautiful. This looks like an amazing adventure- lots of wildlife and great views on the water! What a beautiful place to explore. Excellent article! Your writing was so descriptive that it made it extremely easy to imagine myself there. There was a lot of great insight here; keep up the great work! Those are really stunning pics! How I wish it ere summer-er here lol. That lake of ducks and birds is just so sublime! Worth getting up early for a long road trip such as this one. And how wonderful to enjoy a beautiful sunrise. What a great adventure and the resort you stayed in is superb. Cant believe what a steal of a deal you got on it. Maybe one day I will make it to this part of the world and get to stay at a beautiful place such as this one. What a trip, but it looks like you had a wonderful time and managed to pack such a lot into the short time that you had. 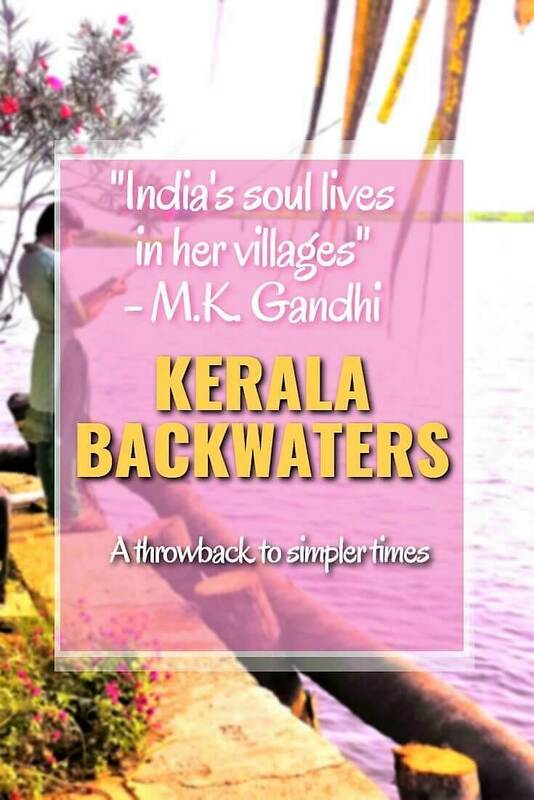 I have read so much about the backwaters and would love to visit them. Perhaps on my next visit to India. Your photos are beautiful as well. I have been wanting to visit the backwaters for a very long time I must say reading your post has only want me to pack and go. Great to know its quite achievable to go from Bangalore as I do visit it for work occasionally. The Lemon Tree Vembanad Lake Resort seems to be the perfect place to spend a few days away from the hustle and bustle of the cities. The houseboats have always been of interest and the food you can get on some of these just stunning. Overall one which I must add to my list for my next trip to India. Thanks a lot. Glad that I could inspire you to make time from your business trips. It’s worth it. Thanks Cecilia. No it was a lake-side resort with optional houseboats to stay in which were anchored to the shore. Despite it being a short trip, it sounds just magical. 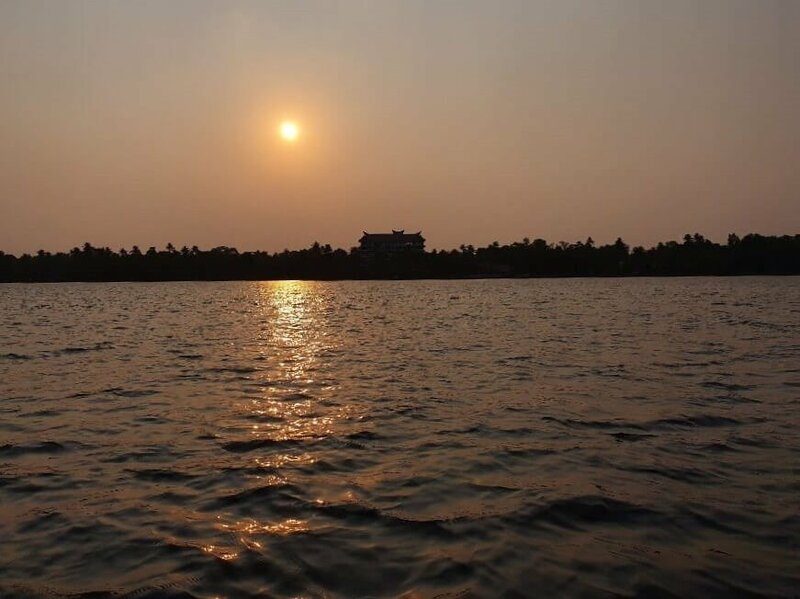 To catch both the sunset and sunrise and to enjoy a tour of the backwaters sounds so relaxing, just what I could do with at the moment! Talk about an adventurous road trip! Even though it was long, it looked like it was so beautiful especially the sunrise at Vembanad Lake! I did backwaters tour of Allepey when I was in class 12th but could not remember that I visited Vembanad lake. The stay at Lemon tree looks worth staying out. The villages of Kottayam and sunrise looks spectacular. Looks like it was a great trip. I still need to see so much of India s it’s great to hear about interesting road trips you can take. Thanks for sharing. It’s a part of the country that I have never explored, so reading about it and picking up tips is always helpful. 600 Kms one way is quite a journey for the weekend, but when the rewards are so beautiful, one tends to forget about the time. The sunrise video is breathtakingly pretty. Moreover, the location of the hotel next to the lake makes it the ideal place. Great tips, thank you. I just left India without seeing Banglore. And this post made me really regretful why I just didn’t see this magnificent place?! I really admire the way you have described the beauty of backwaters of Kerala.Your road trip sounds to be so amazing. I did love to get that sight of the peacocks walking along the road.The views of the lake, birds and trees seem so blissful. I hope to visit Kerala’s backwaters someday for such a dreamy holiday. That must have felt like a long journey from Bangalore but so worth the reward. Kerala is such a stunning part of India and how to to stay near a bird sanctuary. I’d like to check out Vembanad Lake next time I go there. Some fabulous practical tips, great article. How cool that you saw a bunch of peacocks walking along the road. 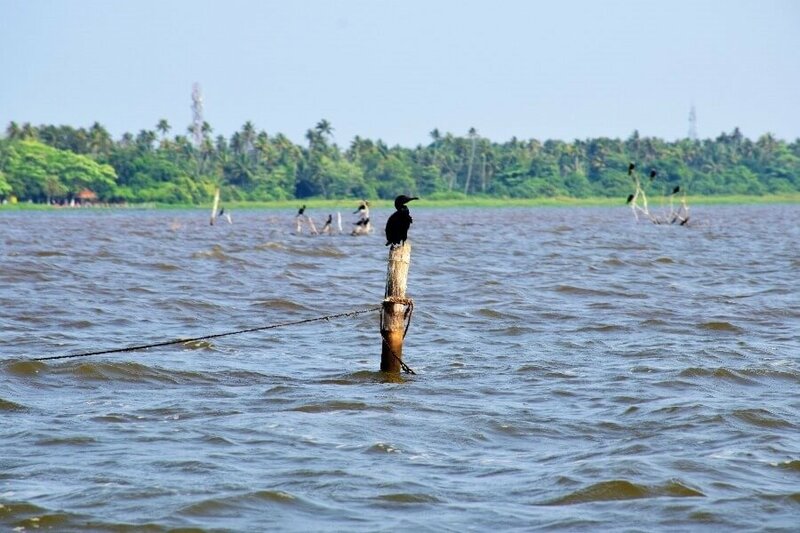 Then you see more birds during your sailing to Kumarakom. Sounds like a heaven for bird watcher. The long drive to explore Kerala Backwaters seems so worth it. This post brought back my memories of the boat rides on the backwaters of Kerala. It is such a serene place. I especially love observing the daily routine of people. Abundant bird life also excites me. I have been here thrice and can go again. It indeed is a soulful experience. Haha, I cracked up at the ‘summerest’. I remember when we visited the Vambanad Lake last time, we took the canoes – the adventurist style! Unfortunately, we missed the sunset while we were there. Kudos to you for waking up so early for the sunrise! You covered so much in this road trip, and I felt like I was right there with you as I was reading through this! Your accommodation at the Lemon Tree Resort looked amazing – I would love to stay there. And the Villages of Kottayam stood out to me as somewhere I’d really love to visit as well.